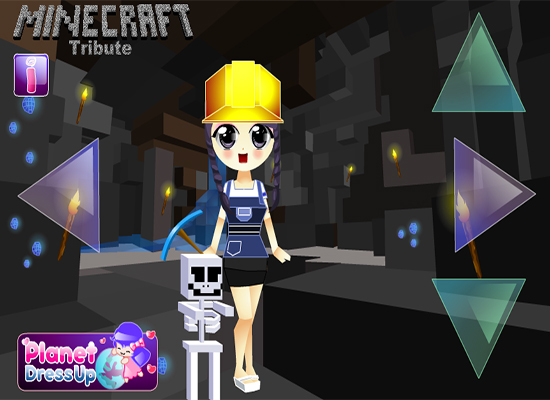 Welcome to the shop in Minecraft named Minecraft Diamond Jackpot Dress Up! In a part where is much far away from the place Steve is staying, there is a girl in a shop to find some great clothes. Your task is to help her choose beautiful clothes and some necessary accessories. In this magical shop, you enable to select varied items such as hats, shoes, skirts, torches, pickaxes, blouses, and pets. Wonderfully, you can also change her hairstyle. Varied items with varied colors will satisfy your requirements. Help her dress up and change her to become an impressive girl! You click to choose a certain piece of clothing or an accessory item.